Red Comet, an accredited, self-paced, online high school launches a credit course on human geography. Red Comet’s new online elective course “Human Geography: Our Global Identity” is launched this summer as part of the company’s broad efforts to introduce a rich mixture of brand new enrichment courses that supplement the existing curriculum. Human Geography is a branch of the social sciences that studies people in relation to the world, communities, culture and landscape. How do language, religion, and landscape affect the physical environment? How do geography, weather, and location affect customs and lifestyle? In this course, students explore the diverse ways in which people affect the world around them and how they are affected by their surroundings. Students discover how ideas spread and cultures form, and learn how beliefs and architecture are part of a larger culture complex. In addition to introducing students to the field of Human Geography, this course teaches students how to analyze humans and their environments. Red Comet offers students a full online program that is engaging and rigorous. The online learning from Red Comet is engaging and it presents all of its topics – even the most challenging ones – in a way in which they can be understood by students. 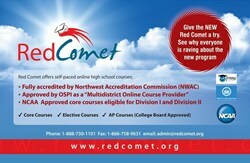 The Office of Superintendent of Public Instruction (OPSI) in Washington State has approved Red Comet as a “Multi-District Online School Program Provider” and a “Multi-District Online Course Provider”. The online program from Red Comet excels both in student satisfaction and in the breadth of its offering. Students who take the online high school classes will be challenged using various learning techniques. This makes it more interesting for students to learn and keep them motivated to complete all their courses in the allotted schedule.